Recent sluggishness in inflation and wage growth has made markets very sceptical about the chances of another rate hike this year. But we are still optimistic that inflation will make a steady comeback as the weaker dollar, higher oil prices and economic strength put pressure on prices and pay. That should secure another hike in December, but the lack of an imminent inflation turnaround might see a few Fed officials scale back their rate hike expectations at the next meeting on 20 September. We're also expecting the Fed to kick start the mammoth task of shrinking its $4.5 trillion balance sheet. We know most of the details, but until now the market reaction has been fairly benign. But the sheer amount of Treasuries the market will need to absorb means a steeper yield curve cannot be ruled out. At this stage, we don't think the Bank will be that phased by the tumbling value of the pound. 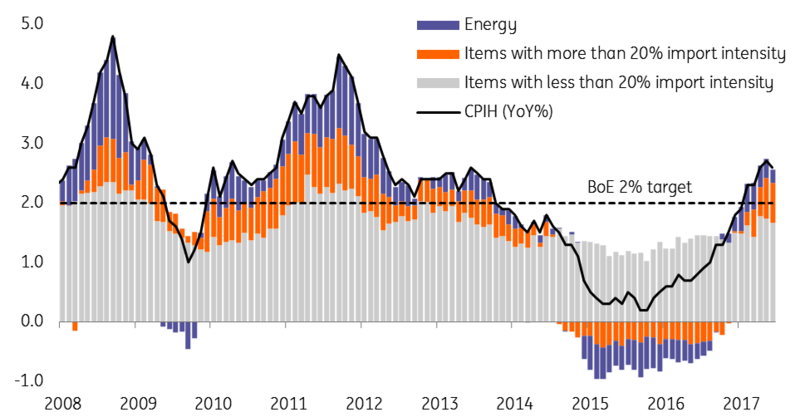 Sure it will add price pressure, but what the BoE is really interested in is domestically generated inflation - and there are few signs of that at the moment. With wage growth set to remain below inflation for much of the next 12 months, consumer spending is likely to remain sluggish. At the moment, there are few signs that other areas of the economy - investment or exports - will fully offset this loss of momentum. So we still think a rate rise is unlikely to come before the second half of 2018 and more likely in 2019. But the pound's recent fall does mean that the Bank will stay relatively hawkish on 14 September as they try and keep two-way rate risks alive in markets. Strong eurozone growth is likely to be the focus of the ECB, with survey indicators suggesting that the recovery will continue into 2018, albeit at a somewhat slower pace than the first half of 2017. Since early summer, the ECB has been struggling with the right game plan. The risk of deflation has disappeared, the economy is going well, inflation remains too low (partly due to structural reasons) and the issue of bond scarcity will become more pressing next year. Finding the right narrative and timing for tapering has been a challenge. The big issue at this week's meeting will be the stronger euro and its possible impact on the ECB's wider game plan for tapering, which to date has been complicated by the strengthening euro, and staff projections. For the RBA, the issues are similar to those of any other developed market central bank. The economy is running not far below trend and seems to be picking up steam; the labour market is tight, with the unemployment rate at only 5.6%, but inflation and wages are conspicuous by their absence. Then again, 2Q17 wages growth did spike a little higher and now exceed 2.0% YoY (including bonuses, 1.9%YoY without), and inflation on various headline and core measures is running only a little below the central point of the 2-3% target range. Hiking rates now would only encourage the AUD to rise further. The AUD has risen by around 10% since the end of 2016, despite the Fed’s tightening, as it has benefited from commodity price increases amidst the synchronous global upturn. Rates are likely to be on hold for the time being unless one or other of the constraints that currently bind it (AUD strength, low inflation, wages) begin to slacken. With household borrowing high, but the likely emergence of any wages growth in the hands of Australian businesses, it's not easy for the RBA. This means it is likely to be on hold for the time being unless one or other of the constraints that currently bind it (AUD strength, low inflation, wages) begin to slacken. As the major central bank that has engaged in unorthodox policies for longer than any other, it'a probably no surprise that we expect nothing other than a continuation of the BoJ’s QQE programme and bond yield targeting for the foreseeable future. That said, it will come as some relief for the BoJ that it can maintain its zero bond yield target for far less than the JPY80tr annualised pace of purchasing that it still notionally commits itself to in its monetary policy statements. We say this because the availability of assets for the BoJ to purchase in the secondary market is fast running out of room. It's problem not unique to the BoJ but has also troubled other fast printing central banks such as the ECB. Rates on hold seems the only sensible forecast for the BoJ right now. Things in Japan are looking better than they have for some time. Japan's GDP growth equates to trend or higher growth. The 2Q17 GDP outcome of 4.0% annualised will almost certainly either be revised down or give way to weakness in 3Q17, breaking this run of growth. Even so, the trend will still look good, and even the inflation numbers are beginning to nudge higher. Governor Kuroda will see no benefit in changing the BoJ stance now, especially against the background of USD weakness; any change would likely just fly straight into a stronger JPY and start to undo any of the good the policy may be doing. Where next for central banks? Who will be next in the race to hike rates?